What content themes should you post about? Which media types should you use? Where should you post the content? Chances are, these are the questions you’ve already asked yourself – and that’s great because they are all big questions. So how do you approach answering them without any data insights informing your approach? The answer is, you don’t. But never fear, the purpose of the SocialROI framework is to assist in answering all of these questions. Before we can begin to answer any of those questions, you need to understand why your organisation uses social media. Boil it down to one single statement that speaks to the business value – what tangible value does social media deliver to your organisation? For example: raise awareness of the product with millennials: get existing customers to renew their subscriptions or increase sales of lagging product. When you think about constructing your statement, consider the 4 stages of the Social ROI Funnel: awareness, interest, desire and action. 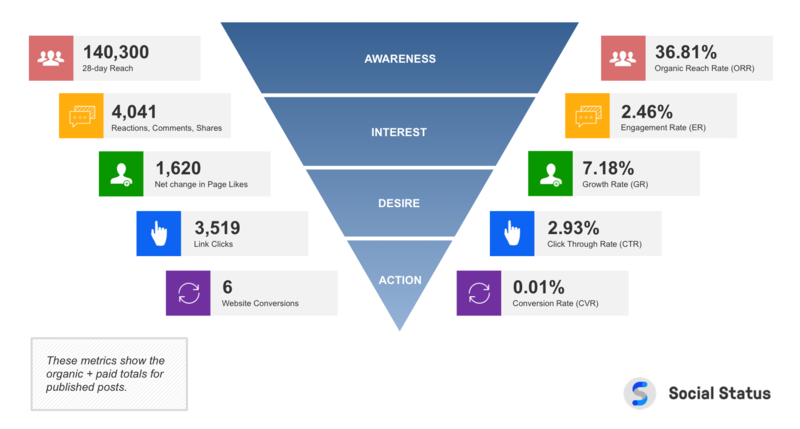 Each stage represents different measurable behaviours and metrics, from reach to interactions and clicks to conversions. For big brands, this statement may relate to the top of the funnel only, for example: ‘foster engagement with mainstream audiences’. For small businesses or e-commerce brands, it may relate to the bottom of the funnel, for example: ‘drive consideration and product sales of Product X amongst the target audience’. In each example, there is a clear focus on why the business is using social media and how it measures its success. Now that you’ve composed your single sentence statement, you need to allocate a percentage of focus you wish to apply to each stage of the funnel in order to reach your objectives. Let’s unpack this by looking at it with a previous example. Say Business X’s objective statement is ‘to foster engagement with mainstream audiences’. Business X should then look to allocate its focus to the awareness and interest areas of the marketing funnel. Now there are a few things that Business X can look to do in terms of allocation. It could allocate 50/50 to each stage evenly or 100% to the interest stage or some other combination 70/30, 80/20 etc. Well if they were to allocate a 50/50 weighting to both awareness and interest sections of the funnel, it will be clear that they care equally about reaching people and engaging people, so they’ll be reporting on topline reach and impressions as well as Interactions and Engagement Rate. From a paid and social perspective, they’ll be reporting on cost per thousand (CPM) as well as cost per engagement (CPE) and looking to optimise both over time. Now say Business X was to allocate a 0% weighting to awareness and 100% to interest, it will be clear to anyone that they don’t care about reach or impression metrics: instead their singular focus is on Interactions and the Engagement Rate. Similarly from a paid perspective, they’ll be focused on optimising their CPE. As a result, the funnel weightings now give you a clear definition as to what kind of measurable behaviours and outcomes you’ll be optimising for and how you’ll report performance to stakeholders. If you don’t have longevity of content performance stats to determine what content to create and curate and where to distribute it, the best way to do this is to look across your industry at competitor content to understand what kind of channels, content themes and media types work best at each stage of the marketing funnel. For the interest stage, you’ll be looking for content that drives the highest engagement rate. For the desire stage, you’ll be looking for content that drives the highest click through rate. 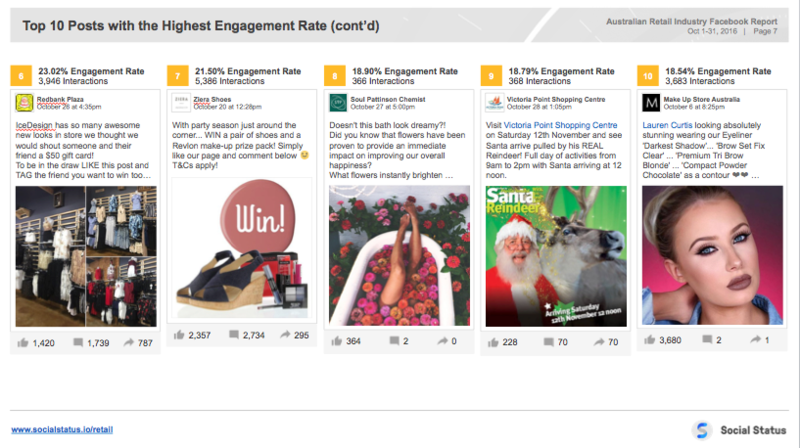 Organise competitor content by the highest to lowest performance and pay close attention to top performing posts. Best practice guides, industry reports and investing in automating your own social media reporting/performance are key. Using Business X as an example again, let’s contextualise them within the Australian retail industry. With 100% of their focus allocated on the Interest area of the marketing funnel, they are looking to create content that will increase both their Interaction and Engagement Rate. So what content will best help them do this within their industry? And what platforms will optimise their results? 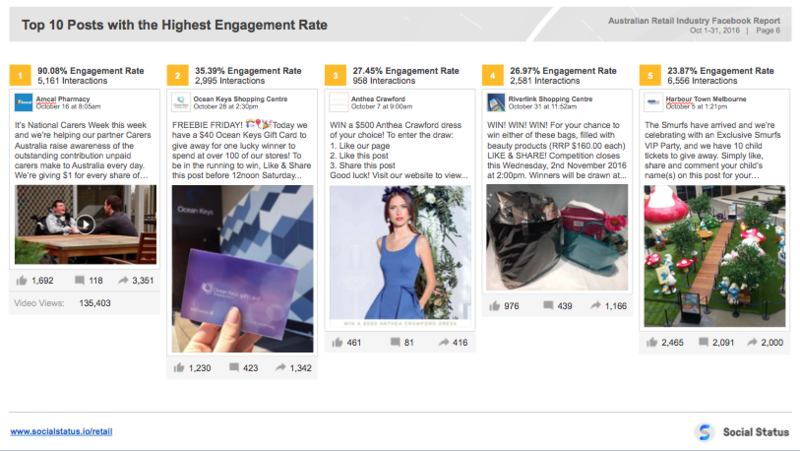 Based on the findings from Social Status’ Australian Retail Industry Facebook Report, 6/10 of the Top 10 posts with the highest engagement rate were competition posts. Traditionally these types of posts generate large amounts of interactions resulting in a higher Engagement Rate due to their like-to-win, comment-to-win or share-to-win entry mechanics. By establishing a well thought out content plan and editorial calendar we are able to establish key themes and topics, points of customer interest/concern and resources from which we can create and curate content that will best create business value and adhere specifically to our objectives rather than writing them on the fly. To answer that question, we need to revisit the very first step – what was our objective? Of course, you’ll measure all available metrics and benchmark them with competitors to see how you sit within your industry, but the focus of your activity will be determined by your initial funnel weightings. Was it your main objective to foster engagement with mainstream audiences? In that case, did your focus on creating interest through competition posts correlate with an increase in your Interaction and Engagement Rate? How did you stack up in regards to both industry and competitor standards? All questions that will determine the wins and losses, shortfalls and gains of your current social media plan and will enable an agile marketing strategy.